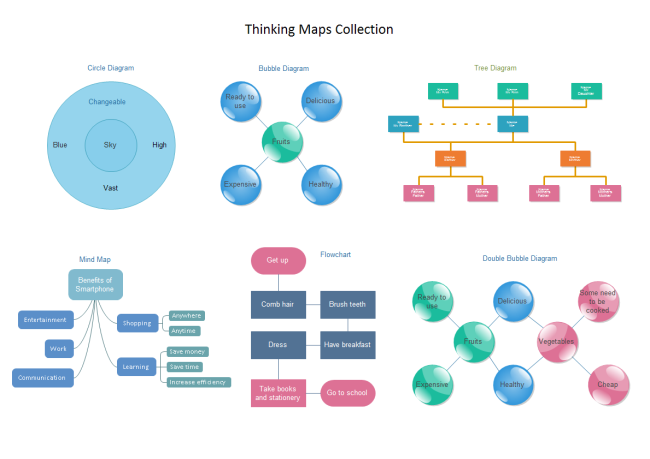 Collects 6 kinds of thinking maps. Users can choose a suitable template to illustrate their thoughts visually and easily. All examples are free for download and print. There are different types of thinking. Thinking maps can be used to give visual depictions to the ways people think and solve problem. Many people are visual learners and we can project images in their heads right away when presented with a subject. Thinking maps are an alternative method of processing information and designing outputs of that information. Thinking maps here have a direct link to photo visual literacy as they direct thoughts into images and allow the individual to process the information. We will introduce 6 kinds of thinking maps below. 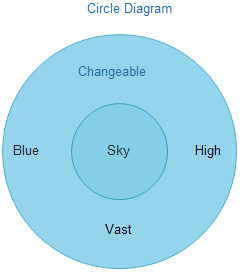 The Circle Map: Defines the context of an issue, the issue is located in the middle and is surrounded by words that describe the subject within the circle. For example, when you describe ocean, you can choose words like blue, salty, deep and vast. 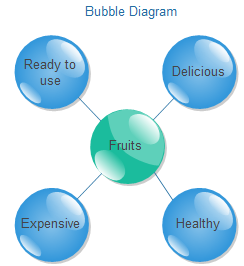 The Bubble Map: Similar with the circle map, it is used to describe a certain subject in the central bubble with its attributes in the surrounding bubbles. More bubbles can be added to describe the topic if necessary. 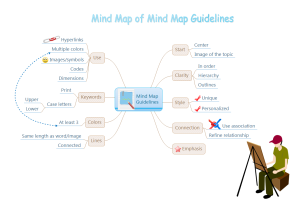 The Mind Map: Suitable for demonstrating brainstorm with the topic in the center and all related ideas displayed around it. Each sub topic can be illustrated by more lower level of ideas. 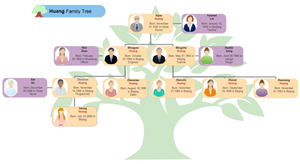 The Tree Diagram: Shows the relationship of different parts, the categories or structure of something, for example the relationship of family members. 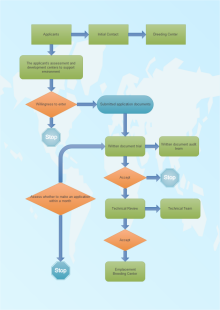 The Flow Chart: Displays the sequence of a certain process step by step from the beginning to the end. By visualizing all steps, people can carry out a process faster and better. 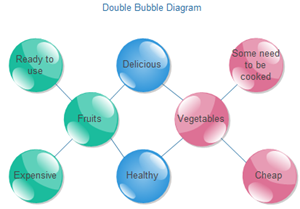 The Double Bubble Map: Similar with a Venn Diagram, useful for comparing two subjects in terms of both commonality and difference. The above diagrams are created by Edraw, a diagramming software enhanced with predefined symbols. Edraw offers you a variety of diagram makers, and provides diagram examples and libraries of ready-made templates and shapes for quick and simple creation of professional-quality diagrams. All templates and examples are editable, printable and for free download. It also supports export of vector graphic multi-page documents into multiple file formats: vector graphics (SVG, EMF, EPS), bitmap graphics (PNG, JPEG, GIF, BMP, TIFF), web documents (HTML, PDF), PowerPoint presentations (PPT), and Adobe Flash (SWF).